The Travel Halo is made from a high quality cotton/polyester/spandex blend sports cloth. The material is very breathable, lightweight and soft to the touch providing maximum comfort. It features a stretchable band designed to fit any head-size. Two small pillows, secured inside the band, are positioned so that they cradle your head and prevent it from rolling to either side while you sleep.The Travel Halo includes a fold-down eye mask to block out ambient light and is designed with portability in mind. 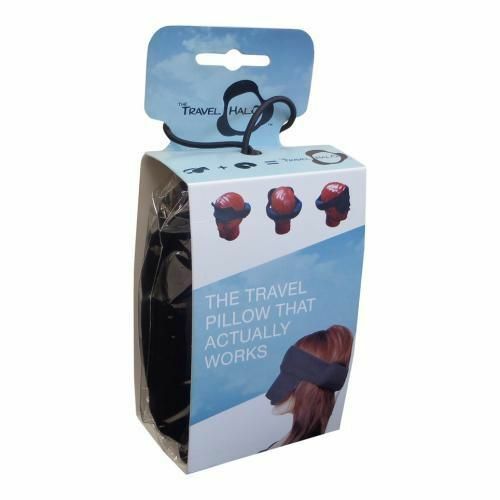 When not in use, it folds up easily and can be stored in the travel pouch included with every Travel Halo.